SUMMARY: When Jason Milwaukee's best friend Sunshine vanishes, Jason knows that something is terribly wrong, but solving her disappearance will require pushing through all the voices in his head and then getting the world to listen to him. His schizophrenia is stopping him from remembering the events leading up to her disappearance, and often he discounts his own memories, and his own impressions. But his deep knowledge that he would never hurt his friend, plus the faith of his parents and a few others in the town bring him to the point of solving the mystery. In the end, it's Sunshine's own love for Jason (Freak) that persuades him of his own strength and goodness. By turns brilliantly witty and searingly honest, Susan Vaught's newest novel is a laugh-out-loud, tear-jerking, coming-of-age story. Freaks Like Us is the perfect blend of emotions, mystery, and humor. Taking a realistic but still at times lighthearted look at mental illness, and having a very strong friendship element, this is one of those books that will change the way you think, and let you enjoy the ride while doing so. With a spry writing style that packs a lot of story in not as many pages, and a protagonist readers will love, Freaks Like Us is fabulous. Jason is schizophrenic, the kind who still hears voices even when he’s medicated. Struggling between dealing with the voices, or taking higher doses of meds that basically wipe him out, every day is it’s own challenge and balancing act for him. Though he is well aware of the way the world, and especially his classmates, view him, he is also a guy with a huge heart, and his own way of seeing things. Loyal to the end to his closest friends, and having the right mix of awkward, growing teenage boy with someone who is still childlike in other ways, Jason’s characterization is astounding, and so honest. I love this boy, from everything he does, to the way he changes, and he is definitely not a character to pass up. On top of the mental illness aspect of this book, which includes not just Jason’s schizophrenia, but Sunshine, a selective mute, and Drip’s ADHD, this book also has a very well done and engaging mystery to it. After Sunshine disappears, Jason’s already tenuous world is definitely flipped all around, giving not only him some huge obstacles to overcome, but the people around him as well. Unsure how much he can be trusted, and even sometimes shedding him a guilty sort of light, Vaught keeps readers on their toes with this one, while still keeping a sympathetic and very honest narrative and element going. Even once things start to click into place, the lead up and execution of this mystery are beautifully done, and will most definitely leave it’s mark. 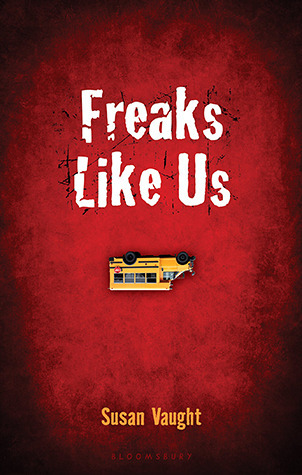 Freaks Like Us had me unable to put it down, and stayed on my mind for weeks after I finished. This isn’t a book that uses mental illness simply as a launching point, or to throw extra problems at the characters. Rather, it’s a book that takes someone just trying to get by, someone wanting what’s best for his friends even if it maybe huts him, and builds the coming of age type story out of it. Vaught incorporates not only the basics of the mental illnesses, and the ramifications both family and social wise, but the extent to which it can not only make things difficult, but also how outside things truly can make life more difficult for the person afflicted. There is a poignancy to this book that shines, and it is definitely a must read, and one I will reread. I really enjoyed this one. I loved how Vaught used the point of view, and as you pointed out, it works with the story instead of being exploitative.